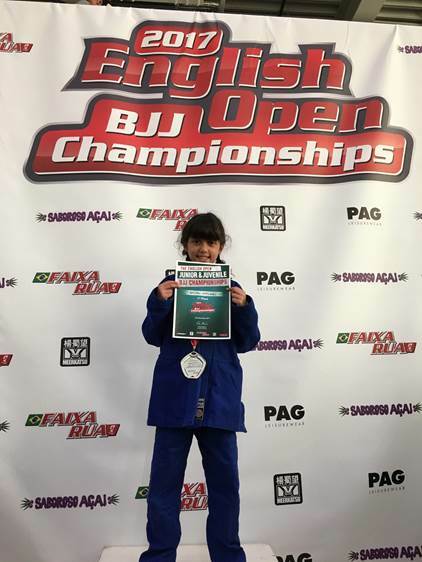 Rachel won The Gold medal at The English BJJ Championship last Sunday. Rachel dominated her opponent gaining points all the time. Even though she failed to score any points against Rachel, her opponent was fast and strong and fought hard to resist but in the end she ‘tapped out’ as Rachel overpowered her on a powerful submission lock … so an instant win for Rachel. She is now Ranked No.1 in the country (for her category). Although BJJ (Brazilian Jiu-Jitsu) has its origins as a Traditional Japanese Martial Art, BJJ is not only a very effective self defence but also a combat sport that has been instrumental in making MMA/UFC one of the fastest growing and major sport today.